The Alcatel-Lucent 8088 Smart Desk-Phone transforms your guest communication experience with its sleek and intuitive interface design. 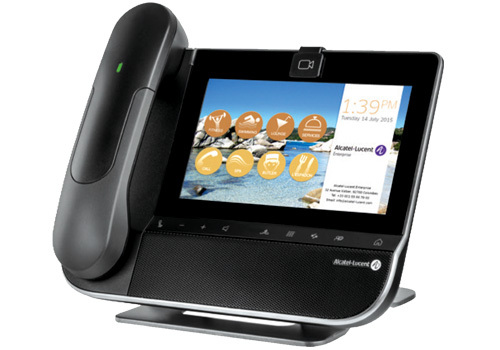 Its seven-inch vivid touch screen offers a smooth multimedia experience, while the Bluetooth handset with outstanding audio allows in-room mobility with excellent audio quality anywhere.The 8088 Smart Desk-Phone features adapted services both for guests and hotel administration. It is your in-room brand advocate with its personalized welcome and customizable interface,adapted to the hotel’s visual identity. It offers one-touch access to hotel spaces and services. Further services, such as room automation, can be added on top of this standard package with the Smart Guest Applications package, available off-the-shelf. ¬ Starting from color scheme, ringtones, background images and screensavers, the 8088 Smart DeskPhone is customizable to reflect the hotel’s visual identity. ¬ Guest services offer guests one-touch access to hotel spaces and services. ¬ Hotel administration features offer easy control on the terminals’ interfaces and enhanced visibility on the room set use. ¬ Further hotel services and room automation integration are possible with the Smart Guest Application package, available off-the-shelf. The elegant design makes it a great brand advocate in all hotel rooms or spaces. Easy one-touch access to all hotel services and spaces. HD audio anywhere in the room. The brightness is auto-adjusted for a better visual comfort depending on lighting (night or daylight). Better in-room mobility and excellent audio quality.